We offer wine tastings in our Vinothek and guided walking tours for groups (6-20 Persons) through the vineyards and the village. The language will be German and/or English. If you book in advance, we serve “Flammkäse” (hot cheese) during the tasting. For our customers we have renovated our courtyard into a modern vinothek, in which our guests can experience wine tastings or enjoy a glass of wine from the vineyards they have walked through after a guided tour on the wine-learning-path. During the guided walking tour through Merl you will learn about the history of our winegrowing village and an exclusive film about the work in our winery shows you the waypoints of the wine throughout the year. The small wine tasting includes 5 different wines. Please register for the guided tours at least 2 days in advance by filling in this form or calling us. We offer wine tastings and guided tours in English language. The big wine tasting includes 7 wines, an Eiswein or Beerenauslese, a film about the work in our winery, water, bread and hot cheese "Flammkäse"
Please register yourself for the guided tours at least 2 days in advance, by filling in this form or calling us. We offer wine tastings and guided tours in English language. Learn more about wine and enjoy the landscape on a tour through the vineyards at the eductional trail. Afterwards you will get to taste five wines of these vineyards in our winery and see a film about the work in the winery. Please register yourself for the guided tours at least 2 days in advance by filling in this form or calling us. We offer wine tasting and guided tours in English language. Join us on a wine tasting tour with us and experience the excellent Moselle wines. Wine lovers know, that Riesling, the queen of vignes, set out to conquer world from the Moselle valley in the 17. century as Merl-Riesling. 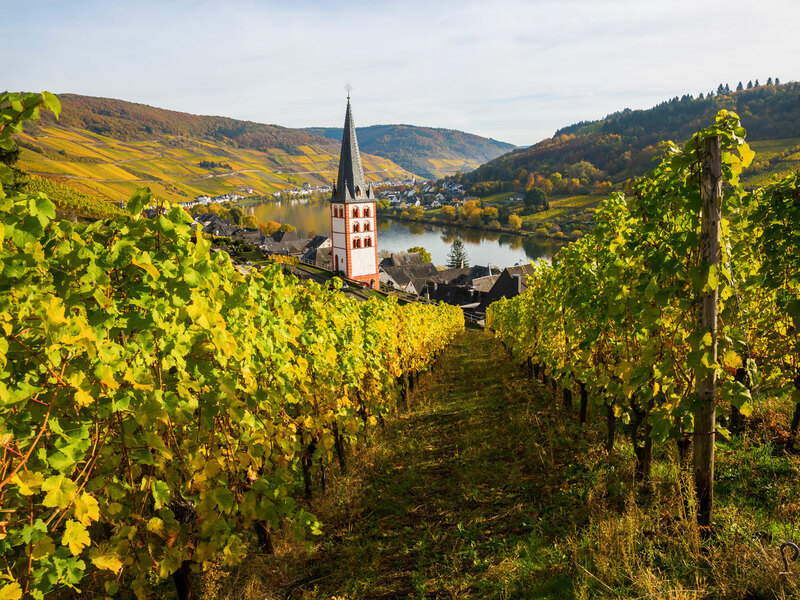 Immerse yourself into the history of Merl on a walking tour trough the village along the trails of the knights Von Zandt, guided by with Silvia Steffens-Durm, the former wine queen of Zell and princess of the region Mosel-Saar-Ruwer. Or learn more about the vineyards of Merl and enjoy the wine growing area on a guided tour alont the educational trail “Merler Pissamann”.